It's been three three years since Nathan and I arrived here in Taos, New Mexico. Three wonderful years full of hard work, friendships built, children born, mountain views, gorgeous weather, strange encounters, challenges, joys, and beautiful memories. We came to help revitalize a dying church, and God has greatly blessed the work here. Taos First Baptist is now a healthy, thriving congregation of unified people who care for on another, love the Word of God, and seek ways to minister in the community. And now, three years later, it is time for us to turn this work over to another capable, caring pastor and move on to a new place of service. In less than two weeks, we will load up a moving truck and travel across the country to Gallipolis, Ohio where Nathan has accepted the call as the new senior pastor of Faith Baptist Church. Changes like this are never easy. The decision to uproot our family, leave our friends and the work we've invested in, and start over serving in a new ministry has not been easy. But we know without a shadow of a doubt that this is God's will. He has made it abundantly clear that He is the One directing our steps, and so we joyfully follow, knowing that He is worthy to be trusted and obeyed. With this transition comes a change in denominations for us, as we leave the Southern Baptist Convention (SBC) and return to our roots of being independent Baptists. 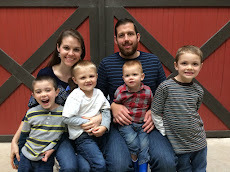 Due to his growing discomfort with many aspects of the SBC, Nathan knew that for conscience and conviction's sake, he needed to find a church that was not affiliated with the convention. When the Lord opened the door with Faith Baptist Church in Gallipolis, Ohio, and we began researching their beliefs, we were amazed to have discovered such a like-minded congregation. This understanding only became more cemented when we visited the church and interacted with the people there. Faith Baptist is a congregation of roughly 160 people who have proven to be incredibly loving, welcoming, and well-grounded in God's Word. We are truly excited about being part of their church family! Another huge blessing involved with this move across the country is the opportunity to be close to biological family. Four out of Nathan's five siblings and their families live in the Dayton area, two hours away from where we'll be living, and his parents are hoping to move there soon as well. I, too, have relatives (grandparents, aunts, uncles, cousins) about two hours away in Cincinnati. After living so far from all our family, it will be nice to be within easy driving distance of many of them! We are excited about putting down roots long term and raising our family in the peaceful, rural community of Gallipolis. The Lord has provided a house on five acres for us just at the last minute that looks to be an ideal fit for our growing family. It will be so nice to have room for our energetic boys to roam and play! We also hope to raise animals such as chickens and milk goats, to plant a garden come spring, and maybe even raise a crop or two! Please pray for us as we say goodbye to those we've come to love here in Taos and begin anew in Gallipolis. I'll admit, there are times when I am tempted to get overwhelmed when I think about all the logistics this big transition includes right on the heels of having a new baby. However, I keep reminding myself to take things one day at a time and trust the Lord for His grace each step of the way. Please pray for fully restored energy and strength when the time comes in less than two weeks to hit the road! Pray for our van to make it to Ohio as it has been having a few mechanical struggles lately. Pray for wisdom for Nathan as he shoulders the task of pastoring a brand-new congregation of people with their own unique needs. Pray for me as I juggle life in a new (fixer-upper) home with three very small children. And please pray for the continued growth of our Taos FBC family as they transition to being under the leadership of a new pastor. As we walk forward into this season of change, we praise the Lord for His leading, for His grace, and for the privilege of serving Him in this life! I have been considering attending an independent Baptist church for a while, what is it you like about these churches?